To begin your unique holiday with us first you must choose your preferred accommodation. Wigwams, Shepherds Huts, Yurts, Lodges or Belle Tents. Each is thoughtfully furnished both on the inside and out. Take in this area of outstanding natural beauty from your chosen glamping home. Sit back, put your feet up, pour a glass of wine and watch the sun set over the rolling hills. These three exclusive Wigwams have the luxury of a Scandinavian Wood Fired Hot tub each and their own toilet and showers. Sleeping up to four people these adult only wigwams are perfect for couples or groups. Wigwams are the latest innovation in rustic accommodation providing the best bits about camping without all the challenges. Full insulation and double glazing keeps wigwams warm and cosy with electricity (already pre-loaded before guests arrival) giving heat, light and power. An opening window allows for stunning views of the surroundings and ventilation on warm summers days. Outside; each wigwam has its own picnic table to enjoy alfresco dinners cooked on your own bbq come fire pit which will provide warmth to sit and star gaze well into the night. 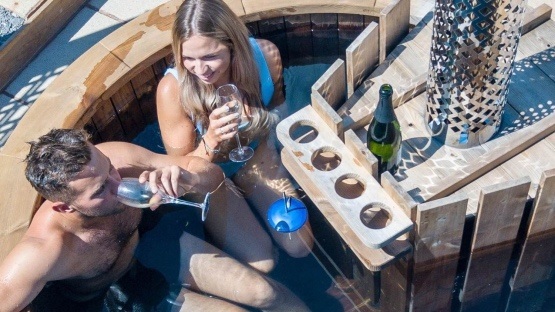 Comes with a complimentary bottle of Secret Valley Wine & two buckets of Wood for the Scandinavian hot tub. 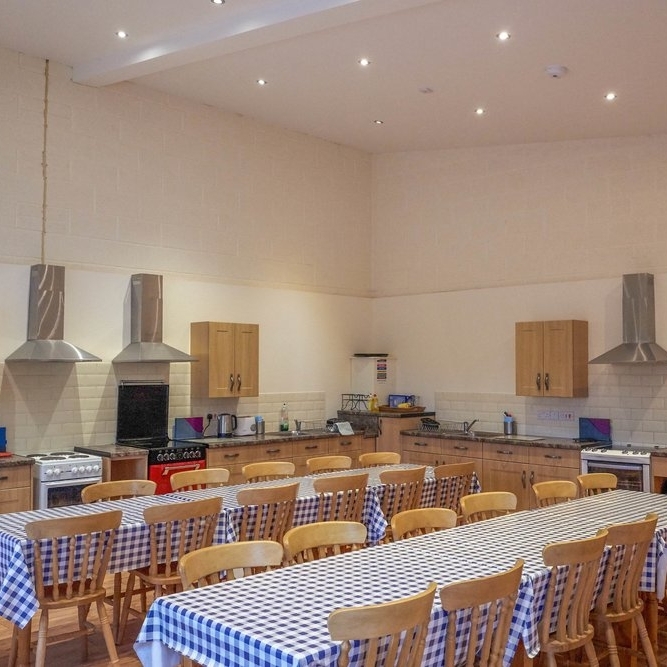 Shower and Toilet Block, Wet Room, Quantock and Owl barn Kitchens kitted out with everything you need for cooking and dining. Both have TVs and plenty of space for large groups to commune. After reading your welcome pack and settling into your glamping home we will be driving around to see you between 5-6pm. 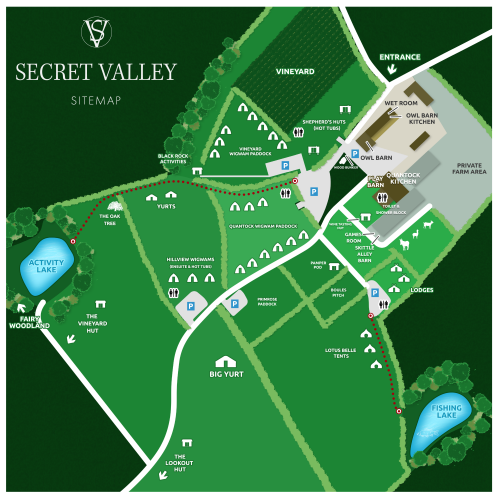 Our Buggy is stocked up with: Wood, Secret Valley Wine, Coal, Cider and Marshmallows available to purchase. This is also the perfect time to ask us any questions you might have. An adult only accommodation (18yrs+), which is dog friendly. There is generally a minimum two night stay at weekends. The price is £145 for two people for a one night stay, for 2+ nights the price is £125 per night. Each Hill View Wigwam can sleep up to four people, there is an additional cost of £30 per extra adult (over the initial two people) per night. Each stay includes two complimentary buckets of Wood for the wood fired hot tub and a bottle of Secret Valley Wine. Dogs are £7.50 per night. The price is £150 for two people for a one night stay, for 2+ nights the price is £130 per night. Each Hill View Wigwam can sleep up to four people, there is an additional cost of £32 per extra adult (over the initial two people) per night. You can bring one well behaved dog if you are staying in the Large Quantock and HillView Wigwams. Dogs must be kept on a lead at all times other than when on a walk. Each unit has its own fire pit / BBQ, we sell wood and BBQ coal. End of March – End of October. During the school holidays and bank holidays there is a two night minimum stay at WEEKENDS. During the week nights through out the year there is no minimum stay. If you are a large group wanting only one night, please contact us to discuss your booking. Arrival time is no earlier than 2.30pm and visitors are requested to leave by 10.30am on day of departure. The closest supermarket is Morrisons in Bridgwater, the closest local shop is Tescos in North Petherton both stores have cash machines. Please bring sleeping bags, pillows, towels, torch, crockery, cutlery etc for use inside or outside your accommodation. There is a kitchen / dining room with everything you need for cooking and eating however we ask that all crockery etc is not taken out of the kitchen. We do not give refunds. In exceptional circumstances we will try and resale the holiday and refund pro rata. There is an admin charge deducted. Free Wi-Fi is available in the kitchen. If you would like to find out more about how we accommodate bookings of 3 or more units then please touch the button below. These are ideal for families or big groups. Paddocks are close together with nine Wigwams in Quantock and eight in Vineyard, both with stunning views of the surrounding countryside. There is 6 large wigwams that sleep up to max 4 persons on comfy platforms, making them the ideal choice for family glamping holiday. Also, 3 smaller wigwams sleeping a couple or a maximum of 2 adults and 2 children (under age of 10). All wigwams include a panel heater, electric lighting and power sockets. These 8 smaller Wigwam Cabins feature a spacious sitting area that transforms into comfortable sleeping platforms perfect for a couples getaway or a family of 2 adults and 2 children (under age of 10). Each Vineyard Wigwam has a panel heater, lighting and power sockets and a fridge, too. Each wigwam has its own picnic table to enjoy alfresco dinners cooked on your own bbq come fire pit which will provide warmth to sit and star gaze well into the night. We have two Wigwam paddocks, the Quantock paddock which has six large and three small Wigwams and the Vineyard which has eight small Wigwams. All our large Wigwams are dog friendly. The price is £30 per adult and £15 per child per night, this is based on minimum occupancy requirements (equal to two adults or one adult and two children per large Wigwam) and a minimum stay of two nights. Single night stays incur a supplement of £13.50. The price is £32 per adult and £16 per child per night, this is based on minimum occupancy requirements (equal to two adults or one adult and two children per large Wigwam) and a minimum stay of two nights. Single night stays incur a supplement of £15. Children are classed as between two and sixteen years, under two years are classed as infants and are free of charge, over sixteen years are classed as adults. All our Quantock small Wigwams are dog friendly, our Vineyard small Wigwams are not. The price is £30 per adult and £15 per child per night, this is based on minimum occupancy requirements (equal to one adult and one child per small Wigwam) and a minimum stay of two nights. The price is £32 per adult and £16 per child per night, this is based on minimum occupancy requirements (equal to one adult and one child per small Wigwam) and a minimum stay of two nights. In a peaceful private spot on the edge of the vineyard, our two Shepherd’s Hut’s are ideal for couples looking for a romantic getaway. Each beautiful hut has a Scandinavian Wood Fired Hot Tub to provide you both with the perfect environment to relax and unwind together in the most beautiful surroundings. The huts on their original iron chassis, are made of wood with old fashioned wheels and steps leading up to a double stable door entrance. The doors and windows allow plenty of sunlight to stream in or allow you to watch the sun set over the vineyard from the comfort of your double bed if you wish! Inside there is also a kettle, toaster, fridge and a traditional wood burning stove (in shepherds hut 2). Outside; each hut has it’s own picnic table to enjoy alfresco dinners cooked on your own bbq come fire pit which will provide warmth so sit and star gaze into the night. 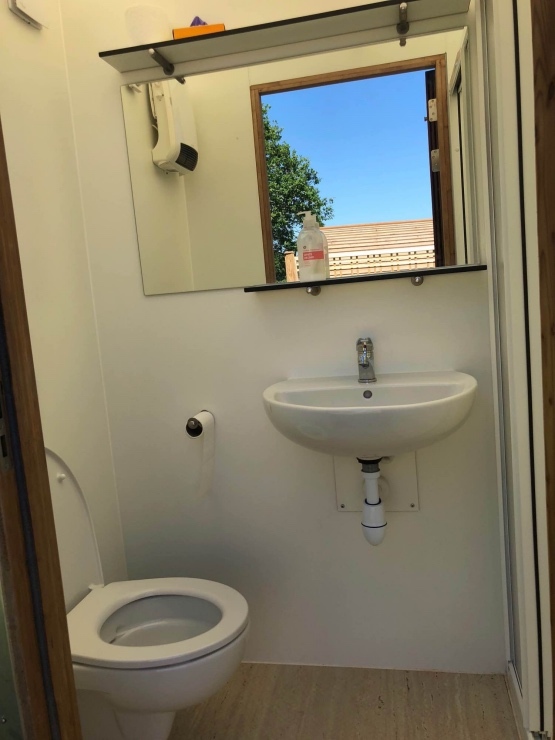 Shared toilet facilities, this accommodation is the ultimate luxurious glamping experience for couples. Each hut sleeps two adults. Both are only a short walk from kitchen and dining facilities. Comes with a complimentary bottle of Secret Valley Wine and two buckets of wood for the hot tub, plus bedding. Adults only. An adult only accommodation (18yrs+). The price is £145 for two people for a one night stay, for 2+ nights the price is £125 per night. Each stay includes two complimentary buckets of Wood for the wood fired hot tub and a bottle of Secret Valley Wine. Bedding is provided, but please bring your own towels. The price is £150 for two people for a one night stay, for 2+ nights the price is £130 per night. Each stay includes two complimentary buckets of Wood for the wood fired hot tub and a bottle of Secret Valley Wine. Bedding is provided, but please bring your own towels. This accommodation is not dog friendly. You can bring one well behaved dog if you are staying in the Quantock and HillView Wigwams. Dogs must be kept on a lead at all times other than when on a walk. Please towels, torch, crockery, cutlery etc for use inside or outside your accommodation. There is a kitchen / dining room with everything you need for cooking and eating however we ask that all crockery etc is not taken out of the kitchen. Our three lodges are situated in an idyllic location boasting panoramic views of the farm. A short stroll to the fishing lake and close to all amenities. Great for families, the lodges sleep up to 5 people on comfortable sleeping platforms with mattresses. These can also be turned into seating during the day. They contain everything you need to be super comfortable during your stay: electric heaters to keep you warm and cosy, sockets to charge necessities, a kettle, lighting, fridge and microwave. Outside; each lodge has its own picnic table to enjoy alfresco dinners cooked on your own bbq come fire pit which will provide warmth to sit and stargaze into the night. Parking is 20 yards from the lodges. Unfortunately dogs are not permitted in this accommodation. The price is £30 per adult and £15 per child per night, this is based on minimum occupancy requirements (equal to two adults or one adult and two children per Lodge) and a minimum stay of two nights. Single night stays incur a supplement of £13.50. The price is £32 per adult and £16 per child per night, this is based on minimum occupancy requirements (equal to two adults or one adult and two children per Lodge) and a minimum stay of two nights. Single night stays incur a supplement of £15. Our three lotus belle tents are positioned in a beautiful quiet paddock with stunning surrounding countryside views. The large canvas tents are very sturdy and suitable for use in all weather conditions. Great for families or small groups, each tent sleeps up to four adults on comfortable single futons. Outside is a picnic table to enjoy alfresco dinners cooked on your bbq come fire pit, which will provide warmth to sit and star gaze into the night. Dedicated fridge in the Owl Barn Kitchen for all lotus Belle Tents Guests. Designed for people looking to get away from it all, there is no electricity supply in the tents. However, toilet and shower facilities are just a short walk away along with a communal kitchen/dining area. Unfortunately dogs are not permitted in this accommodation. The price is £25 per adult and £12.50 per child per night, this is based on minimum occupancy requirements (equal to two adults or one adult and two children per Lotus Belle tent) and a minimum stay of two nights. The price is £28 per adult and £14 per child per night, this is based on minimum occupancy requirements (equal to two adults or one adult and two children per Lotus Belle tent) and a minimum stay of two nights. By a beautiful old oak tree, in a hidden corner of the Paddock lies our peaceful and tranquil Yurt retreat. Yurts are the traditional portable home of the Nomadic Mongolian people. Made here in the U.K, a cone shaped canvas is laced onto a wooden lattice frame sourced from renewable woodlands, to create a magical authentic environment to experience the harmony of round living. Their solid structure offers comfortable accommodation in virtually all weather conditions. Our two small yurts sleep two adults and the medium yurt sleeps four adults. Designed for people looking to get away from it all and immerse with the natural surroundings, there is no electricity supply in the yurts. Dedicated fridge in the Owl Barn Kitchen for all Yurt Guests. However, all amenities are only a short walk away and there is a toilet situated in the paddock. 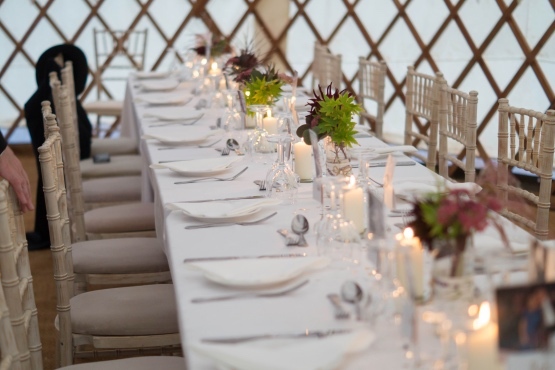 Outside; each yurt has it’s own picnic table to enjoy alfresco dinners cooked on your own bbq come fire pit, which will provide warmth to sit and star gaze into the night. 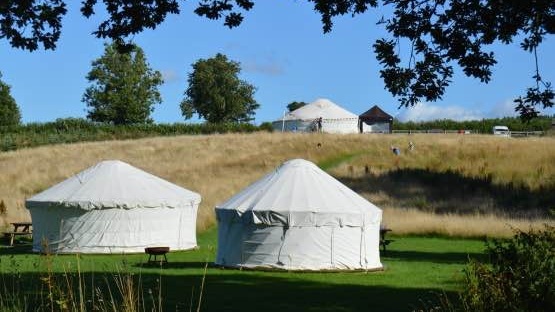 The price is £26 per adult and £13 per child per night, this is based on minimum occupancy requirements (equal to one adult and one child per small Yurt) and a minimum stay of two nights. The price is £29 per adult and £14.50 per child per night, this is based on minimum occupancy requirements (equal to one adult and one child per small Yurt) and a minimum stay of two nights. Our big yurt is in a secluded position with panoramic views of the farm. The cone shaped canvas is laced onto a wooden lattice frame made from renewable woodlands, providing comfortable accommodation in all weather conditions. At an impressive 32ft the yurt sleeps up to twenty people, making it perfect for bringing large groups together! Outside the yurt are picnic tables to enjoy alfresco dinners cooked on your bbq come fire pit, which the whole group can gather around to toast marshmallows and star gaze well into the night. Designed for people looking to get away from it all, there is no electricity supply. However, there is a toilet in the yurt paddock and the showers/toilet block are less than a five minute walk away, along with the communal kitchen and dining area. Dedicated Fridge for Big Yurt Guests in Owl Barn Kitchen. The big Yurt can sleep up to seven people on individual futons. The big Yurt is available some weekends and the price is £26 per adult and £13 per child per night, this is based on minimum occupancy requirements (equal to two adults or one adult and two children) and a minimum stay of two nights. The big Yurt is available weekdays and some weekends, the price is £29 per adult and £14.50 per child per night, this is based on minimum occupancy requirements (equal to two adults or one adult and two children) and a minimum stay of two nights. For one night stays the cost is £20 per person.